Welcome to JUST Capital’s progress report for 2017. It was an incredible year of growth, learning and achievement. From the release of our 2017 list of America’s Most JUST Companies to the launch of our new, interactive website, this brief highlight reel will give you a clear picture of the considerable strides we have taken toward our mission of building a more just marketplace. If you are already a supporter, we thank you and hope that we are making you proud. If you are not yet a supporter, please consider becoming one! And in both cases, we look forward to making 2018 a year of even greater accomplishment. JUST Capital is dedicated to giving Americans the information and the tools they need to drive change in Corporate America on the issues they care most about. Since 2015, we have surveyed over 72,000 people, and held nearly three dozen focus groups across 12 cities. In 2017, we joined forces yet again with our partners at the National Opinion Research Center (NORC) at the University of Chicago, to conduct our nationwide surveys. We then produced our inaugural Roadmap for Corporate America, which was showcased in The Washington Post, Vice Impact, and Fast Company. The report, which will be updated every year, provides companies with the first ever data-driven roadmap for understanding how to balance just business performance for all stakeholders – employees, customers, communities, the environment, and shareholders. We augmented our core survey work with additional, issue-specific polling with YouGov, and enlisted the support of a nationally-recognized expert advisory council to ensure that the polling work was conducted with a high degree of scrutiny and sophistication. We believe our survey data now represents one of the most comprehensive and authoritative “living” databases of how people see big companies and what issues they truly prioritize. Our framework presents an attractive and distinctive new operating system to companies for tracking business performance on the issues that really matter. The release of this year’s list of America’s Most JUST Companies and the launch of our new company rankings platform represented a huge leap forward for the organization, as it was the first time America’s largest corporations were measured on a head-to-head, absolute basis across all the critical issues. 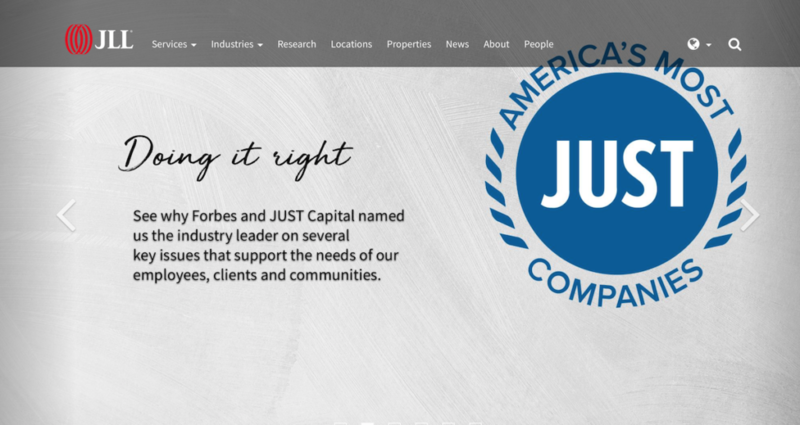 We increased accessibility to the data and built out the tools needed to understand it – including the new JUST Capital website. The new digital experience brings our rankings to life, enabling visitors to freely explore how companies rank overall, by industry, and on any of the specific issues that matter to them: from worker pay and living wage, to environmental impact and job creation, to product quality and discrimination. In the first month, the site saw considerable upticks in traffic, including an 88% increase in pageviews, 81% in session length, and 20% in individual users. The top performers – the JUST 100 – were awarded our newly-designed Seal, and provide a powerful benchmark to incentivize just business behavior. We are heartened to report that of the 107 Seal winners, 72 have advertised it or are otherwise in discussions to do so. Employ 38% more workers in the U.S.
And generate an average 8% higher return on equity. The rankings release became the focal point of the year for informing, engaging, and activating all of our stakeholders – corporate leaders, investors, foundations, influencers, and the general public – at one moment. 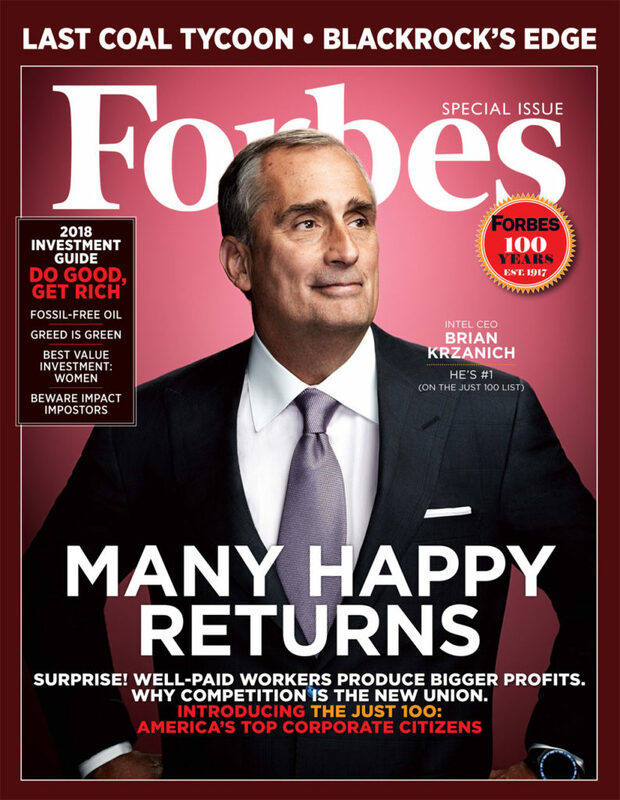 Forbes, our media partner, showcased the JUST 100 and our highest ranked company CEO, Brian Krzanich of Intel, on their December 26 cover, and produced a wide array of in-depth coverage in their print issue and on their expanded microsite. Millions more engaged with the rankings via other media outlets including Fast Company, Bloomberg, CNBC’s Mad Money, Business Insider, and Sustainable Brands. America’s Most JUST Companies and influencers, like Richard Branson, Deepak Chopra, and Arianna Huffington, helped to drive massive marketing reach and engagement, leveraging our creative campaign assets. We received 138 million impressions on Twitter alone, with companies including Accenture, AT&T, Humana, IBM, Intel, P&G, and Rockwell Collins advertising their inclusion in the JUST 100 across their social media platforms, websites, blogs, and PR channels. Our New York City Launch Event welcomed 400+ leaders from corporate, investor, and nonprofit communities, and featured an impressive slate of leaders from America’s Most JUST Companies, including Intel CEO Brian Krzanich, Humana CEO Bruce Broussard, Corporate VP and Head of Microsoft Philanthropies Mary Snapp, CHRO of North America Beverages and Nutrition at PepsiCo, Andrea Ferrara, and SVP of Corporate Affairs at Amazon, Jay Carney. We hosted a robust discussion with these leaders, who shared how they define a just company and prioritize competing interests to drive change. To truly fulfil our mission of building a more just marketplace, we know that we must work with partners to drive adoption of the JUST Capital framework – the data, the rankings, and the tools they power – by each of the market’s primary stakeholders. This means reaching consumers, investors, policymakers, advocacy groups (the public and nonprofit sector), and of course the companies themselves to create the system effect we know is needed. To that end, we have expanded our strategic corporate engagement team to work with C-Suite executives on behavior change and are facilitating ongoing conversations with the largest publicly-traded U.S. companies, including leading employers like Walmart, PepsiCo, Amazon, Microsoft, JP Morgan, and others. We’ve tripled the number of companies participating in our data review process through our corporate portal and received over one thousand data submissions, enabling us to create a more accurate measure of company performance while driving greater disclosure and activating conversations for change. 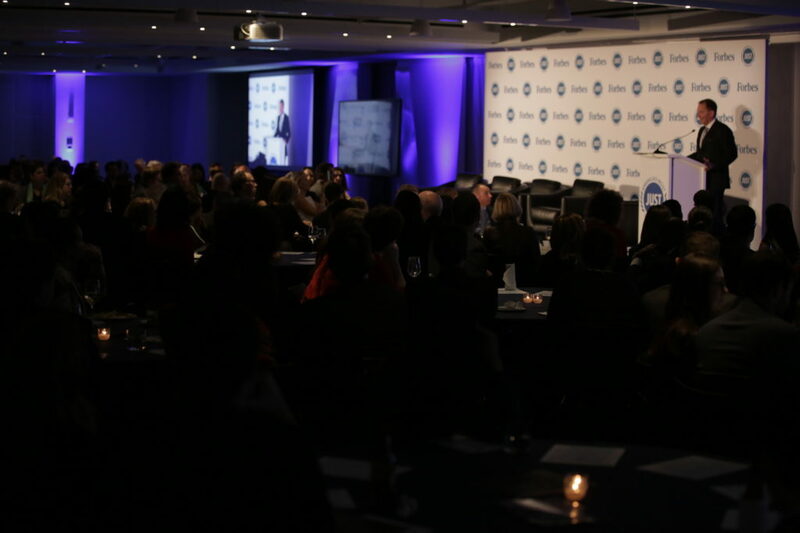 We also expanded our capacity as a key convener of business, investment, and nonprofit leaders on core issues of shared concern, crafting event experiences with thought leaders like Richard Branson and The B Team, Deepak Chopra, the Chamber of Commerce Foundation, and more. We have deepened our ties with academic institutions and business schools, including Yale University’s Center for Business and the Environment, MIT – where we have an ongoing collaboration with Amy Glasmeier’s Living Wage Calculator as well as the Laboratory for Aviation and the Environment, the Darden School of Business at the University of Virginia, students and faculty at Harvard University, Columbia University, and New York University, which houses Ethical Systems, a collaboration of top researchers. Additionally, we brought together some of the leading public opinion research experts in the country to review our polling work, including Andy Weiss at Mathematica, Nancy Belden at Belden Russonello Strategists, Don Dilman at Washington State University, and Jeff Brazell at The Modellers. We also explored new data partnerships with The Data Incubator and Development International, in addition to expanding existing relationships with Glassdoor on wages and worker treatment metrics, Good Jobs First on fines and settlement data, and BoardEx on corporate governance metrics. Finally, we’re strengthening relationships with advocacy groups, policymakers, and other agents of change who specialize in the issues identified in our polling, and in whose hands our data can leverage dramatic change. These include DoSomething.org, Out Leadership, and Inspiring Capital on community action; the Center for Popular Democracy and NELP on retail wages; Harvard’s Labor and Worklife Program and Root, Inc. on employee engagement; and Panorama on paid family leave. We’re also building out our work with state-based groups and policymakers in Washington to provide state and county-level data and insights around our core issue work. 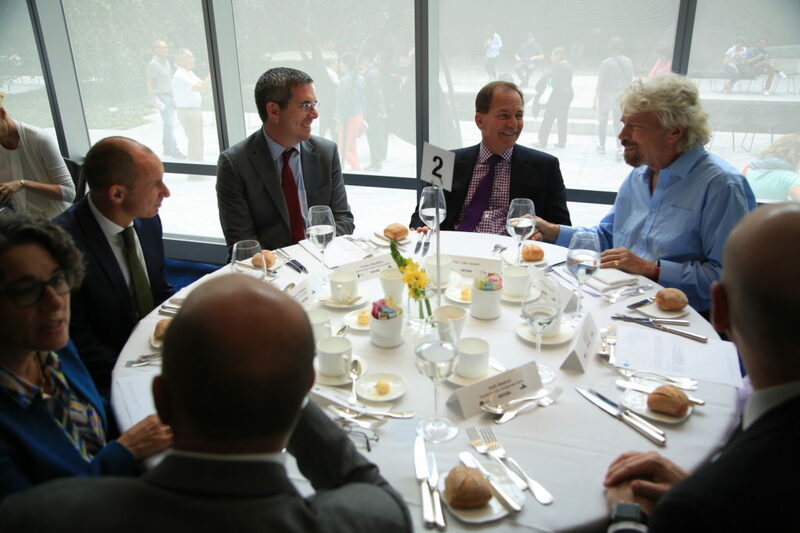 Building the investment case for just business behavior is critical to our systems approach. We continue to produce groundbreaking new research and analysis that demonstrate the business case for and encourage investment in just companies (we call it “JUST Alpha”). Our first Index, the JUST Capital U.S. Large Cap Diversified (JULCD) Index, is a collection of the top 50 percent of just companies in each sector, and was launched in November 2016. 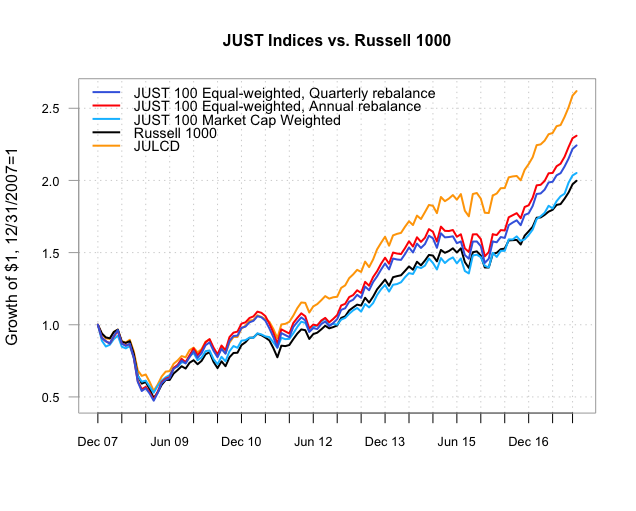 It is one of only a handful of such indexes featured on Bloomberg’s Intelligence ESG dashboard and since inception has beaten its benchmark, the Russell 1000 Index, by over 3 percent with minimal tracking error. The Index meets the pressing need for a broad-based equity market benchmark, reflecting the values of the American public without sacrificing investment return. Over the last year, companies in the Index exhibited significantly higher returns, lower volatility, shallower stock price declines, and higher return on investment capital than bottom-ranked companies. In December 2017, Goldman Sachs filed a registration statement for a new passive ETF based on the JULCD. In addition, we issued a steady stream of research work demonstrating that investing in just companies is not only good for America, it makes financial sense. 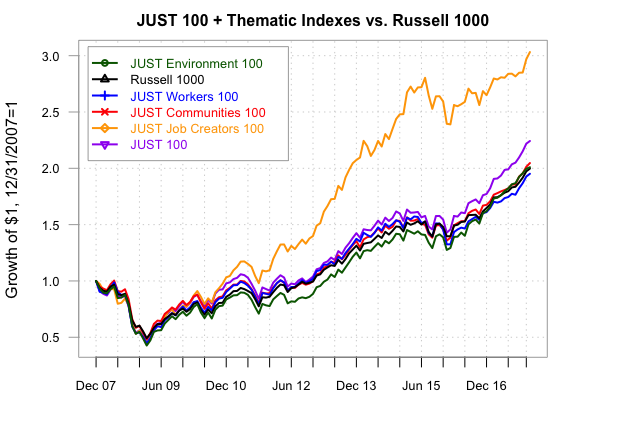 And we’ve begun the research that will underpin the next wave of JUST indices, led by the JUST 100, as well as thematic indices highlighting the top performers in our Workers, Communities, Environment, and Job Creation drivers. Finally, we conducted an extensive program of outreach to the investment community to explore how our data may be used in their day-to-day strategies. This encompassed discussions with over 75 public pension funds, impact investors, foundation endowment managers, family offices, wealth managers, fund managers, investment advisors, and banks. The intelligence gathered from this process will drive our product strategies for the financial community in the coming year. In 2018, we will accelerate our ongoing release of data and insights to continually raise awareness of both JUST Capital and the underlying issues related to creating a more just and equitable marketplace. We will deepen our research capabilities, expand our proprietary data sets, build strategic external engagement partnerships, and create actionable tools. Our relationships with the corporations we rank will deepen, and as trust grows, we expect to drive greater data disclosure and more meaningful action on America’s priorities. 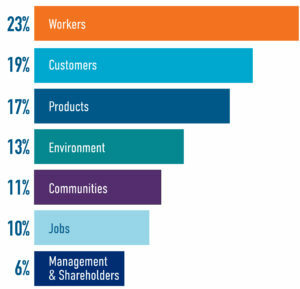 Since worker-related issues consistently poll as the most important to Americans when it comes to just business behavior, we will focus in particular on this theme, especially the areas of work and pay, exploring ways to raise wages, reduce workplace discrimination, and promote quality jobs. We will also focus on how business can promote healthy, vibrant communities, working with Annie E. Casey Foundation, the Robert Wood Johnson Foundation, and others. And we’re moving forward with a strong environmental agenda, releasing data and insights on air pollution and other environmental indicators with EDF, NRDC, the VoLo Foundation, and the Zegar Family Foundation. Refinement of our polling and ranking methodology, corporate research model, and thematic analysis in support of the 2018 list of America’s Most JUST Companies. The creation of a ratings framework to quantify and analyze company announcements tied to tax cuts, in an effort to create transparency and accountability around tax reform. The development of new online interactives for companies, nonprofits, advocacy organizations, and policymakers showcasing data on environment, health, and wages. The release of critical new wage analysis on how many Americans in low-wage sectors rely on public assistance programs to make ends meet. The development of new data on healthy workplaces and communities, including a health index and tracker for healthy workplaces. The launch of the first ETF based on a JUST Index, in partnership with Goldman Sachs. Construction of a beta version JUST Alpha toolkit, to help investors explore the financial performance of just companies, along with an ongoing, comprehensive tracking of the market impacts of just business behavior. As a 501(c)(3) registered charity, JUST Capital is substantially funded by grants. We’d like to thank all of our funders from the bottom of our hearts for their generosity and continued support.